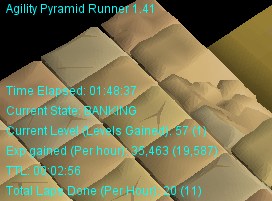 -Runs Agility Pyramid Training Area, get 100k+ Gold/hr and 20k+/hr agility xp with this script depending on your level. -Take screenshots of your progress reports and post them so I can add them to the thread. Runs in both fixed and resizable. Supports Banking (At nardah bank). 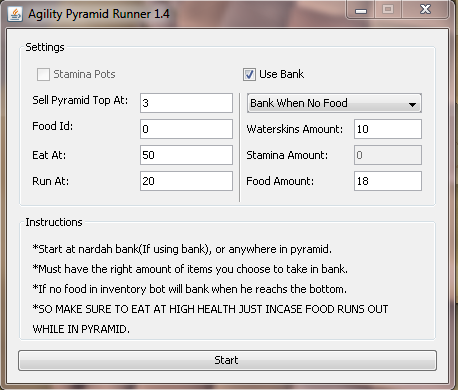 Eats any food when health reaches the amount you set(If no food and banking is disabled it will log out). Collects pyramid tops and sells them for good profit. Request anything you want to be added in this topic. Please rename your script. "Pro" is not allowed for non-Premium scripts. the bank feature doesnt work with me, it takes the items, runs a bit and stops. Its a bit insufficient too when it takes 18 food and only 8 waterskins. Better takes 18 waterskins and 8 food. (im high level agility) Hope u can look at it, or know what i mean. Further more its a good script without te bank. Thanks! Thanks for feed back will look at it as soon as possible. Try running in fixed if having problems with the exit door/planks/climbing rocks at the top because those three the bot can't find the object location automaticly i am trying to make it calculate where to click as accurate as possible. Yeah I always run in fixed, that wasn't the issue. In fixed mode it kept clicking like 2cm under the exit door. And when i wanted to correct it by changing camera view it just ignored it and kept spamming the floor. And another thing: when it reaches the top, it sometimes runs past the pyramid top, and goes to the next obstacle, when its there, he wants to jump back at the golden top, but it cant, because he already took the next agility obstacle... Maybe you can build in to go to the floor below, run that one over to get the golden top without walking passed it. 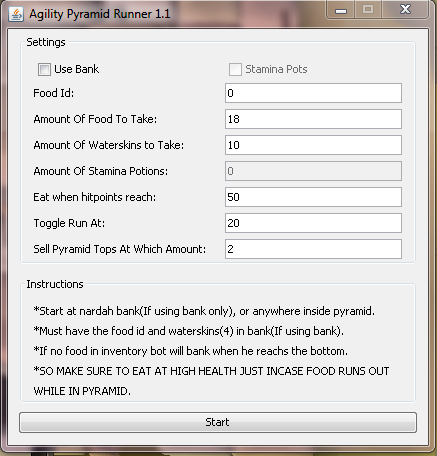 Fixed try now i just updated also added option to choose how many food you want to take and how many waterskins. the walking from bank to pyramid can be a bit more smooth. It only runs for a small distance. then stops, etc. it flags real close to the character. Maybe you can change that to a bit more further away position so it doesnt waste time waiting for a new click. Also it got me stuck at the first rock climbing obstacle, when you reach simon. It just waits right next to simon. I can post a picture at the location if you want. But the rock climbings get me stuck so far. Now testing the pyramid. Retrieving bank items goes so far so good. sometimes it clicks two times on an obstacle at the pyramid, when it jumps over the wall, it goes back to the other side haha, at the first level of the pyramid right when you enter. The first wall. Try switching between fixed and resizable and tell me which one works best. retrieving the golden pyramid top to simon goes well, it doesnt get stuck at that rock climbing thing. its only the top one. when you go from the desert to simon. Posting fix to sdn if your version is 1.2 then its fixed. maybe you can make it a left click, when he picks up the golden top. he still missclicks now and then. runs past it, but it goes back now, to stil retrieve it in stead of stopping. Thanks Fixed V1.21 wait for it to update. i pushed it. the script isnt in the sdn anymore haha, i cant test it :( can you put it back in? Updated to version 1.4 now posted an image of how gui looks like now and a proggie. 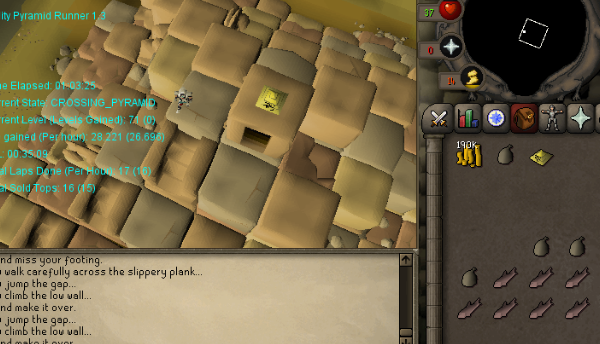 Gonna test this out the other agility scripts are all broken right now..